15 April 2014 – Major improvement works to Stanney Lane, Ellesmere Port are underway in a bid improve better accessibility between the town centre and the Sport and Leisure Village and Cheshire Oaks. 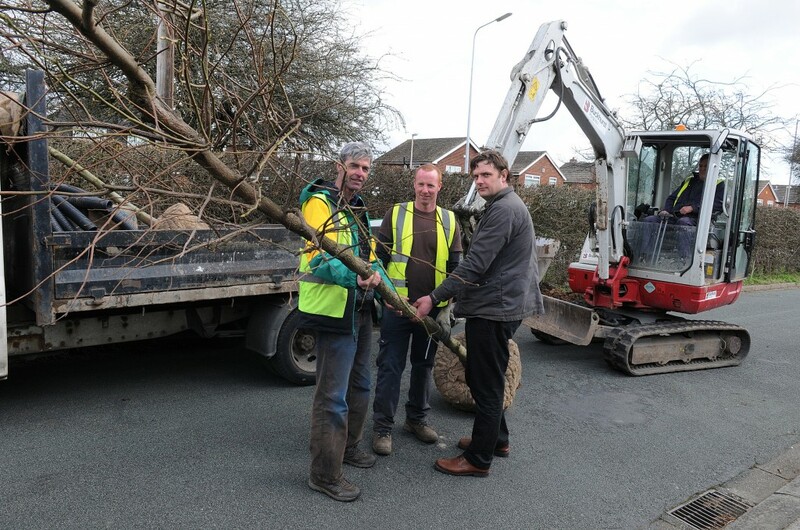 The first stage of the works has seen more than 70 trees planted along the route as part of a wider upgrade of the road, a key gateway into Ellesmere Port’s town centre. Planting has taken place along different sections of Stanney Lane including adjacent to Civic Way Car Park, the Army Reserve Centre, and in the hedgerows between the vehicular carriageway and the service roads. The current scheme of work also includes stretches of the new shared footpath and cycle lane along Civic Way Car Park and in front of the Army Reserve Centre designed to improve accessibility for cyclists and pedestrians. Stanney Lane Boulevard has been prioritised in the Ellesmere Port Development Board’s Vision and Strategic Regeneration Framework. Chairman of the Ellesmere Port Development Board, Robert Mee, said: “Stanney Lane provides a key route into the town’s centre and I am really pleased with the works so far. “Natural landscaping will visually connect existing and future development opportunities and the upgraded shared cycleway and footpath will provide better accessibility. The landscaping works have been designed by the Council’s landscape architect and are being delivered by Dunkil. Local member, Councillor Justin Madders, said: “If we are to encourage more of the visitors who currently go to Cheshire Oaks into the town centre then it is very important that we have an attractive and welcoming entrance to the town. Together with improvements to the junctions on the motorway around Ellesmere Port, the Stanney Lane Boulevard project will create an improved perception of arrival in the town for visitors. The shared cycleway and footpath will support healthy lifestyles and may contribute to a reduction in the growth of local car journeys made. Local member, Councillor Bob Crompton, said: “This development will not only deliver an aesthetic improvement to Stanney Lane but the further development of the road will address some of the long standing concerns of residents regarding the safety of the junctions on the road which currently make joining Stanney Lane difficult. Joe Ward, of Dunkil Developments, said: “The weather has been very good for us to work in and we have been able to plant around seventy trees just in time for the spring. The concept design study for Stanney Lane Boulevard was published in 2013 with a public consultation event held in the Civic Hall. PHOTO CAPTION: Left to right: CWAC Town Centre Manager Jochem Hollestelle, Dunkil’s Joe Ward and the Council’s Landscape Architect Edd Snell.